Luke graduated from circoarts in New Zealand with a diploma in circus media. He specialises in complex 3-7 ball juggling and also works with free standing ladder balance, clubs, knives, stilts, and fire arts. He has recently completed his latest tour of New Zealand, with 'Circus Aotearoa', where he is known as "New Zealand's hottest three ball juggler." Luke now works as a core performer in Will-o'-the-Wisp and Long Shadow Stilt Theatre. 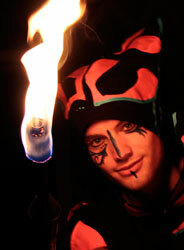 With Will-o'-the-wisp, Luke performs Club swinging, juggling, staff and fire eating in the new show "Flame Eccentric." He was also a core performer and directors assistant in the stilt walking scene of the fire event, "The Voice of the ancestors" Woodford folk festival 2010/ 2011.